Freshly laid-off Wisconsinites Patrick and Barbara McDougall are going to sunny Florida for a modest romantic vacation. But the motel they picked isn't quite a pastel paradise, and they have to be midwesterners and make the best of a bad situation. Except bad goes to worse, and a string of misfortunes renders them unable to leave the state. Meanwhile, the next Mexican-American War is being fought, this time in Fort Lauderdale, between the Kentucky mafia and the Oxy cartel over control of the lucrative pain clinic market. Latinos are turning up dead, hillbillies are wandering the beach trampling sand castles, and cops continue arresting doctors wriggling out of office windows. But it's never really a party until Serge and Coleman arrive. Cruising down U.S. 1, Captain Florida and his perpetually altered sidekick are on a mission to film the best reality show ever! Back at their motel, the McDougalls are peeking out the curtains. They've become very popular, especially with Serge, who believes he's found the perfect stars for the pilot of his new TV series. Are the McDougalls safer with Serge or should they take their chances on the mean streets? Will Coleman get tired of signing autographs? Can pelicans be used as murder weapons? Is time running out for our heroes? And, finally, the question still on everyone's lips: What's up with Florida? 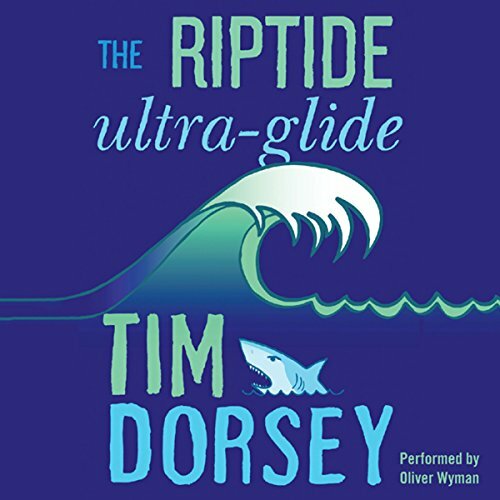 Stay tuned for all the answers in...The Riptide Ultra-Glide! Readers of this series will have to continue with this episode. New listeners would be better advised to start at the beginning of the series, but not completely necessary. As usual, Dorsey pokes at Florida issues, (violence and crime), and even some local Wisconsin political crazyness. Same great reader. He does an excellent job with this zanyness and the characters. Because I love historical fiction that is sommetimes very heavy with drama, Its always great to read another fun story about Serge Storms and Coleman. It's like having a couple of crazy friends that you love to hear about their antics to have a lighthearted and sometimes a laugh-out-loud time with. Another great work by Tim Dorsey. I am a huge Serge fan and love all his quirky historical drives through Florida, but this book has my heart as it was set in my hometown! Lol. It was great to hear Serge trekking though my neck of the woods and chuckling at his adventures as usual. Great book! Great book and great narrator. Serge is such an odd character and this is such an interesting way to discuss Florida's vibrant/eclectic culture. Loved it, ALL the way to the end! Loved that surprise! Hope it’s the lead in to the next book! I have been disappointed in the last couple books I read on this series, but this is a goodone and had me hooked again. Tim Dorsey comes up with some of the most ridiculous phrases and situations one can imagine. When I first start one of his books, I think 'no, this is just too much' yet if I listen much beyond 15 minutes, I'm hooked! I typically read spy and murder mysteries and Dorsey is a nice switch to lighten up my listens! Give any of his books a go! I do prefer the previous reader. Serge sounded more Serge-like in the earlier books.